You know the feeling. Sunday night…standing in front of the fridge and pantry…wondering what on earth you can throw together for dinner. Preferably that makes leftovers, so you can actually eat lunch this week. For me, the answer is almost always pasta. It’s possibly the best food ever—a versatile foundation, and there’s almost nothing you can’t pair it with. That’s where kitchen sink pasta comes in. 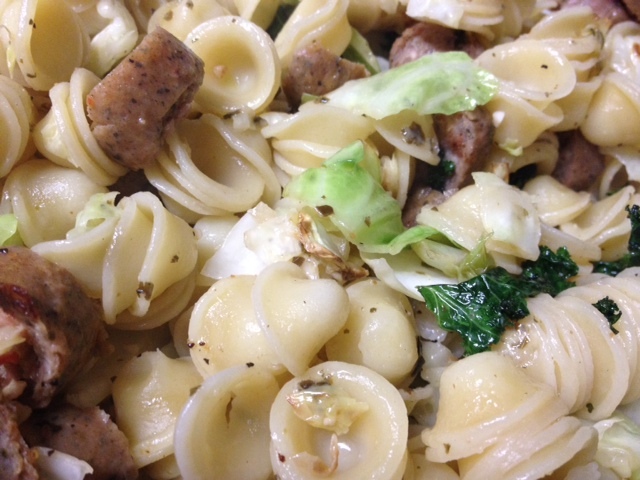 So a couple weeks ago I was in that exact situation and ended up making yet another version of kitchen sink pasta. And it was GOOD. And kind of unique. Boil water for pasta, salt it once boiling, and add the pasta. Cook til al dente. Do not overcook! I used oricchette for this one, but any pasta will do. 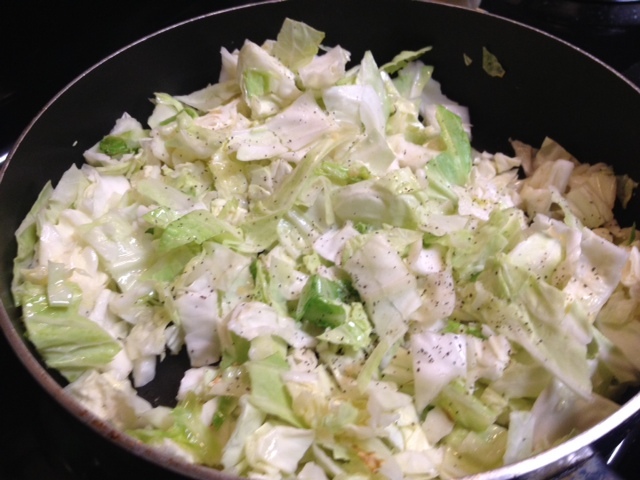 I had half a head of cabbage leftover from my CSA box, so I chopped that all up and sauteed it with some salt, pepper, and garlic. Softens it up a little. 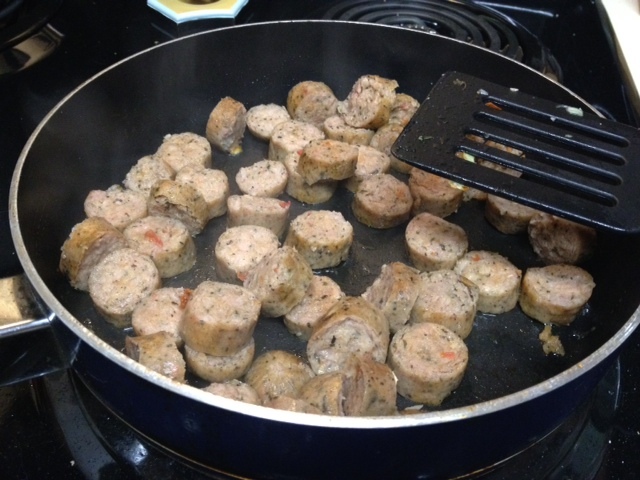 I had some sun-dried tomato chicken sausage from Trader Joe’s in the freezer. I boiled it for a few minutes to thaw it, then sliced it up and sauteed it in a tiny bit of olive oil until golden. 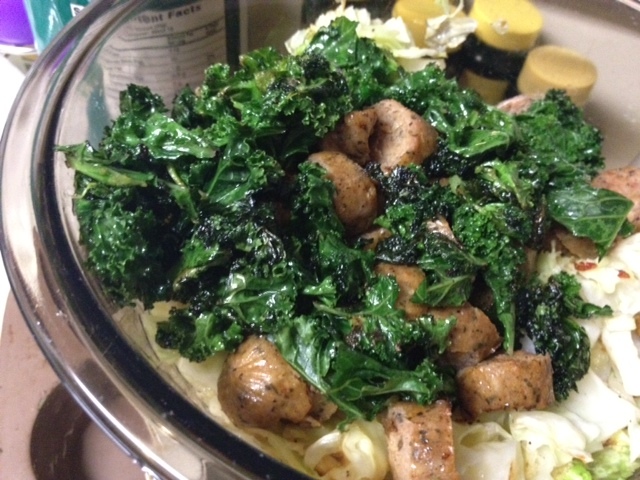 Saute some kale in olive oil, with salt, pepper, and a little garlic powder until slightly crispy. I posted this recipe previously, takes like five minutes. 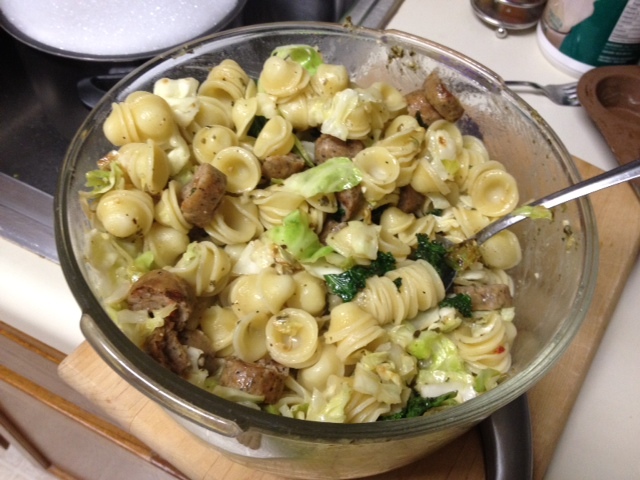 Throw it all in a bowl and toss together, maybe with a tiny bit of olive oil and some grated parmesan or asiago. Et voila! Dinner, with some to spare. 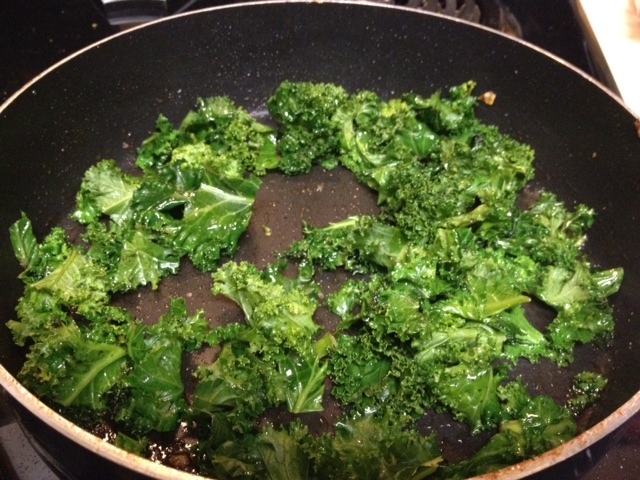 Saute some kale in olive oil, with salt, pepper, and a little garlic powder until slightly crispy.